skirts and unitards for children and adults. Basic Practice There are 35 products. Child dance leotard w/attached circular skirt and 3 melange rose lines and ribbon flowers. Perfect outfit for ballet dance class. 96% Cotton, 4% Spandex. Child's sizes: TOT, SC, INT, MC, LC. Child dance leotard with three melange rose or light green lines and ribbon flowers. Perfect outfit for ballet class. 96% Cotton, 4% Spandex. Child's sizes: TOT, SC, INT, MC, LC. Waltz of the Flowers two-ply knit dance wrap skirt with self-fabrics ties. 100%Polyester. Sizes: Small Child, Medium Child, Small Adult (Large Child- Medium Adult), Large Adult (Large Adult-XLarge Adult). Black long sleeve leotard with attached circular skirt, bateau neck line. Designed for character, lyrical, modern, contemporary, latin and ice dance. 90%Polyester, 10%Spandex. Sizes Child's: SC, INT, MC, LC Adult's: XS, SA, MA, LA. 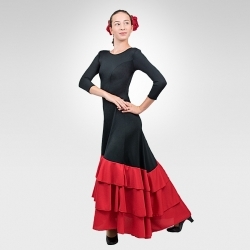 Black spandex asymmetrical double circle dance skirt with yoke and elastic in waist. 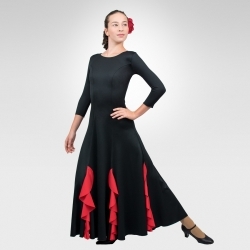 Designed for character, lyrical, modern, contemporary and latin dance. 90%Polyester, 10%Spandex. Long sleeves shorty unitard with cut-out sides and back, thumb holes to keep sleeves in place while you dance. Two silver color nailheads "zipper" appliques. Great for modern, contemporary and hip-hop performance. 90%Polyester, 10%Spandex.